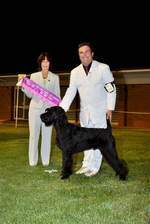 Here is a collection of Giant Schnauzer photos from our album that we hope you enjoy. Stablemaster Northern Hope European Winner 03'+04'. Dog of the Year all breeds Finland 2003-2005. Grandfather of our current show dogs. Wulfgar Storm ( Jet ) Aged 7 months. Wulfgar Saige Aged 4 months. Int,Swd,Spa,Est Ch Quintus v. Bregherbos. Great Grand Father of our current show dogs. Finn wins Junior in Show Dog of the Year Support Show October 2005. Oprah head shot March Specialty 2004. 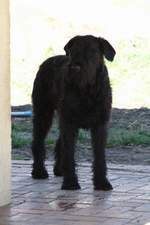 Finns grandfather INt CH Northern Hope. Finlands Dog of the Year 2003-2005. Zena Schnauzer Club of NSW Specialty Show March 2004. Int CH Stablemaster Electric Lady Great Great Grand Mother of Finn Seven and Roweena. HUNTER AFTER 1ST SHOW AT GYMPIE IT'S HOT!!!!!! !